embark on the path of eternal health and well-being. The science of spiritual wisdom, an art of physical, mental, and emotional wellbeing, and a set of several practices that have been enlightening the human generations since the Vedic era - the description of Yoga will go endless. The science that took birth on the sacred soil of India has produced a number of yogis and spiritual gurus over the course of history. Coming to the modern times when mankind is struggling to lead a healthy life, the yogic science has given people an opportunity to see themselves in the mirror of time and better their way of existing on the planet. The drastic demand for Yoga and its increasing popularity in present times have advocated the youth generation to follow the teachings of this spiritual science. 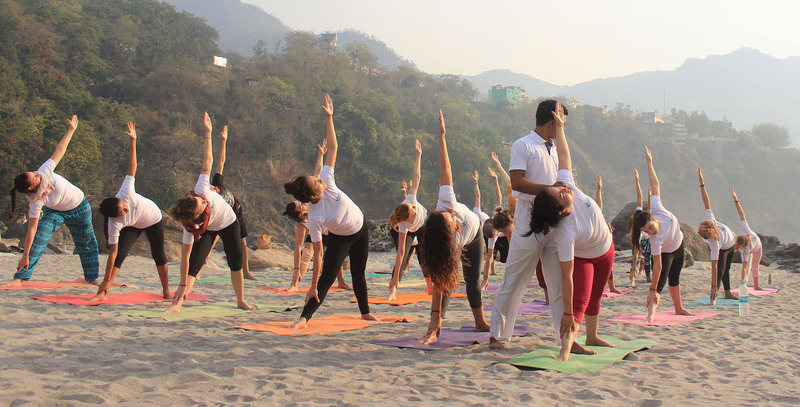 Let the holistic aspect of Yoga enlighten you to the core of your heart with the purest knowledge of Yoga at Rishikul Yogshala’s Yoga center in Gurgaon. Introduce yourself to the yogic knowledge of the highest standard by devoting the precious moments of your life to the spiritual discipline. 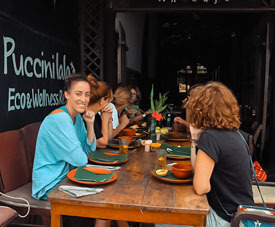 Spend some time in the vicinity of time-served Yoga instructors, who have dedicated their lives to the practice of Yoga. Enhance your physical health, better your ability to fight tough situations in life and pacify the soul in search of life’s truth with the sacred study of Yoga in Gurgaon. 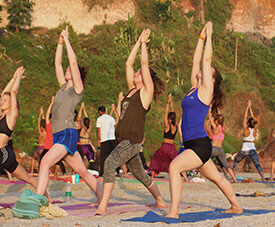 Sail through the holistic channel of Yoga and reach the point of yogic enlightenment when you make Yoga an integral part of your life at Rishikul Yogshala. Why Yoga Courses in Gurgaon? There is no doubt in the fact that our country is the biggest hub for Yoga education in the world. Yoga lovers from all around the globe come here to attain mastery in the subject of Yoga. While Rishikesh, Kerala, Goa, etc. have been the prominent centers of spiritual Yoga in India, metropolises remain far from the touch of Yoga’s classical style. Many people in Mumbai, Delhi, Gurgaon, etc. aspire to learn and explore Yoga for their all-round development. For those citizens, who aim to become a Yoga teacher by assimilating the sacred form of Yoga, Rishikul Yogshala presents the best Yoga teacher training in Gurgaon. Our experience of more than 7 years in the field of Yoga study will introduce you to the most authentic Yoga education in your own city, Gurgaon. 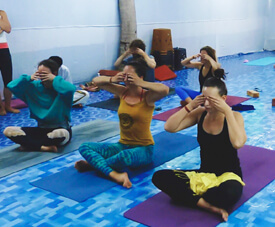 We are highly committed to offering the traditional training of Yoga based on the study of Hatha Yoga and Ashtanga Yoga including several other Yoga types such as Yin Yoga, Karma Yoga, Vinyasa Yoga, etc. The training of Meditation and Pranayama marks the soulful flow of spiritual training in order to bring peace and awareness in the brain and soul. A deeper analysis of the anatomical study of Yoga with the education of Yoga’s impact on various organ systems such as Respiration, Circulation, etc. We will take you through the study of ancient yogic pieces of literature such as Bhagavad Gita, Yoga Pradipika, etc. for understanding the yogic way of life. 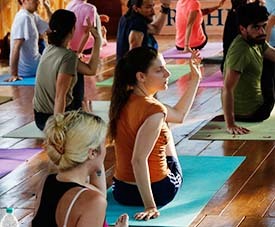 Training of Yoga’s physical aspect with the education of Yoga asanas and their practice in an authentic way with Adjustment and Alignment techniques. Take part in our well-crafted Teaching Methodology sessions to learn the characteristics of a Yoga teacher and the art of handling a Yoga class with perfection. Indulge in self-practice and peace-sponsoring Yoga exercise such as Yoga Nidra. Our trainers will make you understand the ideal way of leading a wholesome life with the principles of Ayurveda and its healthy dietary tips. With the yogic way of inner purification, prepare yourself for an intensive Yoga session. Rishikul Yogshala is a globally prominent name in the Yoga world with branches in countries like Nepal, Thailand, Vietnam, etc. Getting a Yoga training certification from this Yoga Alliance affiliated institute will certify you as a registered Yoga teacher. Carry the legacy of this month-long training program to your career and involve yourself in serious Yoga teaching anywhere in the world. A Yoga Alliance certificate for teaching Yoga anywhere on the world as a certified trainer. A better mental, physical and spiritual health. Emerge as a good decision maker with a pure and refined mind. Deepen your understanding of the finest levels of the yogic science.